Photo courtesy the Flickr page for the International Federation of Red Cross and Red Crescent. Emmy Petit’s story is similar to that of many other young people in South Florida. Petit was born to Haitian immigrants and raised in Miami. Her parents, like many immigrants, came to the United States looking for better opportunities than their home country could offer, such as employment and education. More than 200,000 Haitian immigrants reside in Miami-Dade and Broward counties, accounting for the largest concentration of Haitian immigrants in the country, according to data collected by the U.S. Census Bureau in 2015. Petit has family members still in Haiti who she hopes will be able to come to the United States one day, she said. But that possibility seems bleak now. The Trump Administration announced in late November the termination of Temporary Protected Status for Haitians looking to leave the island. TPS is a humanitarian program that was signed into law by George H. W. Bush in 1990. The program grants temporary residency to nationals of countries affected by ongoing conflict, natural disasters or other “extraordinary and temporary conditions.” TPS was extended to include Haitian refugees after an earthquake devastated the island in 2010. Approximately 60,000 Haitians have been allowed to work and live legally in the United States since 2010 and have been immune to removal under TPS, according to the Department of Homeland Security. The program is set to expire on July 22, 2019. Petit’s uncle and three of her cousins reside in the United States on the TPS program. The program has allowed her family members to live in the United States without fear of deportation. However, with the termination of the program for Haitians, TPS recipients must make plans to return to Haiti by July 2019. Otherwise, they will risk deportation. However, Petit said Haiti still has “a lot of work to do to create a stable environment for its citizens.” Haiti is the Western Hemisphere’s poorest country, with 60 percent of its population living in poverty, according to the CIA’s World Factbook. Junior Diane Petit-Frere voiced similar concerns about the ability of Haitian refugees to return to a stable Haiti. 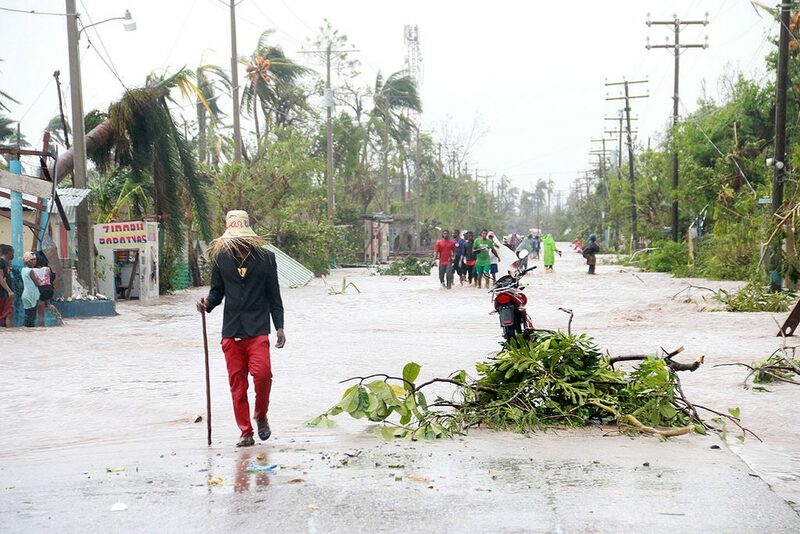 Petit-Frere, who last visited Haiti in 2014 and still has family members there, said that the lingering effects of the 2010 earthquake are still visible on the island. “There are still people living in tents who lost their houses; there are still roads that haven’t been constructed yet,” said Petit-Frere, a double major in political science and English. Mirza Tanis, a junior majoring in finance from Port-Au-Prince, last returned to Haiti in 2015. For Tanis, the Trump Administration’s decision is a blow to those on the program, but also to the economy of the island nation, since so many Haitian-Americans and Haitians living in the United States were sending resources to their families on the island. “You are taking away the ability for Haitian refugees on the TPS program to provide for their families back in Haiti, and also for them to take care of themselves,” Tanis said. Remittances account for 29.4 percent of Haiti’s GDP, meaning that the deportation of Haitian individuals in the United States would likely strike another blow to the world’s 18th-poorest economy in terms of GDP per capita. Even so, a common theme among the Haitian community at UM is the ability to persevere, along with the dream that one day all of their family members will be able to come to the United States legally. For Petit’s cousins, earning full U.S. citizenship is a dream that may never become a reality. Petit’s cousins have exhausted the legal channels to citizenship, applying for residency but spending years waiting for their applications to be processed, a wait that continues to this day. For her family members who were not born in the United States, “residency would be a dream,” Petit said.